These ESD containers you can protect your electronic components from the typical electromagnetic interference (EMI), electrostatic or induced fields. To prevent the build up of an electrostatic charge these containers are made with a conductive barrier in mind to keep these fields from penetrating. Washing with normal cleaners will not affect the permanent conductivity of the bins. Molded from a carbon filled copolymer polypropylene material with an electrostatic decay rate at less than 0.1 second that meets military specification Mil-B-81075B. Its surface resistivity is less than 10 Ohms-per square. 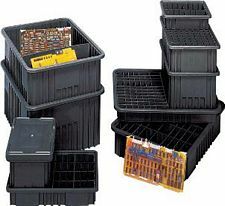 Containers can be divided by length and/or width, allowing a subdivision down to 1-1/8-inch square compartment size to protects small-to-medium parts. Use optional snap-on lids, dividers, and label holders to create exactly the solution needed for your application. Be sure all units are properly grounded according to your use.